Chris Jones provides firm clients with a seasoned perspective on environmental and regulatory issues, as well as a unique understanding of state and federal environmental regulatory agencies. Chris has more than 25 years of experience in the environmental field, including six years as Director of the Ohio Environmental Protection Agency and four years as Chief of the Ohio Attorney General’s Environmental Enforcement Section. While Director of Ohio EPA, Chris was a two-term elected president of the Environmental Council of the States (ECOS), a national organization of all of the directors of state environmental agencies. In this role, he served as the primary liaison between states and the U.S. EPA. This experience gives Chris a unique understanding of both state and federal environmental regulatory agencies and allows him to provide firm clients with a seasoned perspective on environmental and regulatory matters as well as government relations issues. Chris has represented businesses and individuals in enforcement proceeding by both U.S. EPA and Ohio EPA. He has counseled clients on regulatory compliance issues related to the Clean Air Act, the Clean Water Act, and both hazardous and solid waste issues under RCRA, and he has counseled clients on brownfield redevelopment projects. He has served as an expert witness in a number of cases, including for a brownfield developer in a dispute over a multi-million-dollar redevelopment. 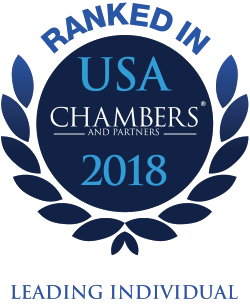 Chris is routinely recognized as one of "America's Leading Lawyers" by Chambers USA, most recently in 2018 in the area of Natural Resources & Environment. He also is selected for inclusion in The Best Lawyers in America© (2012-2019) in the area of Environmental Law. He has an AV Preeminent Rating from Martindale-Hubbell and is listed in Corporate Counsel’s 2012 Top Rated Lawyers Guide to Energy, Environmental & Natural Resources Law. Chris is currently a member of the Board of the Greater Ohio Policy Center and is the former chair of the board of trustees of the Nature Conservancy, Ohio Chapter. He is also a senior member of the board of directors of the Environmental Research Institute of the States (ERIS). In the past Chris has served as chairman of the Lake Erie Commission, as a governor-appointed member of the Great Lakes Commission, as a member of the Ohio Air Quality Development Authority, the Ohio Water Development Authority, and the State Power Siting Board. Chris was an original member of the Clean Ohio Council. Chris is also a member of the Ohio and Columbus Bar Associations.